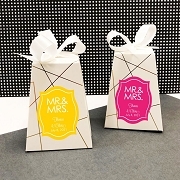 Your event will have the perfect photo finish when your guests take home these glass photo coasters as their favors. These trendy glass photo coasters offer a unique, and functional, way to display photos while also saving the furniture from the dreaded ring! 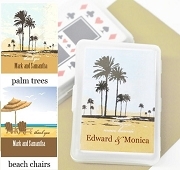 Packaged in sets of two, each is a 3.5" square with a 1.75" x 2" photo opening filled with a preprinted note that says, "Thanks for helping to make this a picture perfect day!" 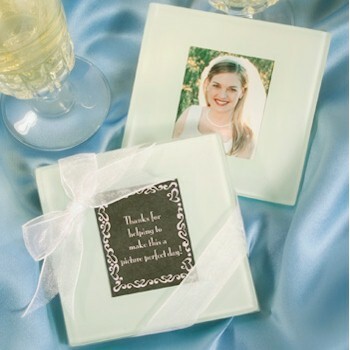 Great for photos of your event or any of your guests' favorite shots, each set of two glass photo coasters comes packed in a clear box tied with an white organza ribbon. The photo coasters were a cost effective, practical gift for our guests and they loved it! Everyone likes to feel special so it was a very nice touch.